Bring a large pot of salty water to a boil. Prepare a bowl of water with ice and salt in it. Asparagus: Snap off or simply cut off two inches from the bottom of the asparagus spears. Using a vegetable peeler, shave some of its outer skin for softer results. Cut the spears in half lengthwise and blanch for 1 minute in salty rapidly boiling water. Using a spider or slotted spoon, transfer the spears into the ice-cold water and let them cool completely. Drain well and refrigerate with a little bit of olive oil if not used immediately. Snow peas: Blanch snow peas in the same water for 2 minute until bright green and crisp. Cut in half lengthwise in 2 or 3 strips. Set aside. Fava beans: At last, blanched the beans for 1 minute then plunge them into ice water and once cool enough to handle, using your thumbs release the beans from pale skin that surrounds the beans. Set aside. Mushrooms: Sauté the mushrooms in a large pan on medium high heat in some olive oil for about 5 minutes until soft and fragrant. Season with some sea salt and freshly ground black pepper to taste. Transfer to a bowl and keep warm. Purple potatoes: Skin on, boil potatoes for 10 minutes in salted water until cooked but not mushy. Once cool enough to handle, cut into thin slices. Branzino: Wash the fillets and pat dry. Spray the baking sheet with vegetable oil cooking spray. Place the fish fillets on the baking sheet skin side down in a single layer. Generously drizzle with good quality olive oil on top, and season with salt and freshly ground black pepper to taste. Top each fillet with fresh basil leave and 2 thinly sliced pieces of lemon. If not cooking immediately, cover the baking sheet with plastic wrap and refrigerate. Let it stand at room temperature for 10-20 minutes before roasting in the oven. Preheat the oven to 400 degrees F with the rack in the middle and roast the fish for 12-15 minutes, depending on the size of the fillets. Mint-basil pesto: Blend the mint, basil, nuts, cheese, lemon juice, garlic, 3/4 teaspoon of salt, and 1/2 teaspoon of pepper in a food processor until the herbs are finely chopped. With the machine running, gradually blend in 1/3 cup of oil until the mixture is smooth and creamy. If serving for a big crowd, layer the asparagus spears in a cross thatch pattern on one big oval dish. Then scatter some fava beans in between the spears, some snow peas cut in half along the rim of the plate and a thin layer of refreshingly sweet pea shoots (optional) on top. Liberally scatter some quickly sautéed mushrooms, thinly sliced radishes and purple potatoes. 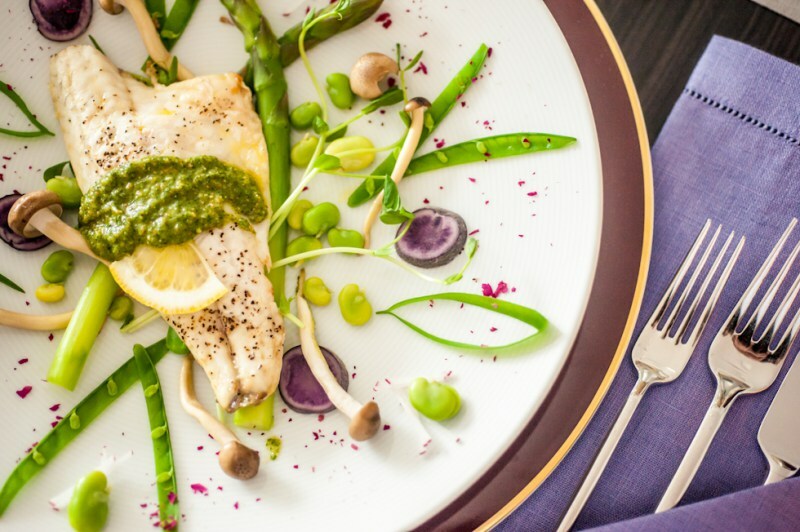 Top the vegetables with Branzino fillets and serve along with mint-basil pesto on a side.